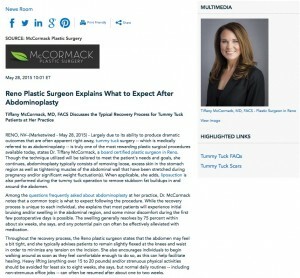 Tiffany McCormack, MD, FACS discusses the typical recovery process for tummy tuck patients at her practice. Reno, NV — Largely due to its ability to produce dramatic outcomes that are often apparent right away, tummy tuck surgery – which is medically referred to as abdominoplasty – is truly one of the most rewarding plastic surgical procedures available today, states Dr. Tiffany McCormack, a board certified plastic surgeon in Reno. Though the technique utilized will be tailored to meet the patient’s needs and goals, she continues, abdominoplasty typically consists of removing loose, excess skin in the stomach region as well as tightening muscles of the abdominal wall that have been stretched during pregnancy and/or significant weight fluctuation(s). When applicable, she adds, liposuction is also performed during the tummy tuck operation to remove stubborn fat buildups in and around the abdomen. Among the questions frequently asked about abdominoplasty at her practice, Dr. McCormack notes that a common topic is what to expect following the procedure. While the recovery process is unique to each individual, she explains that most patients will experience initial bruising and/or swelling in the abdominal region, and some minor discomfort during the first few postoperative days is possible. The swelling generally resolves by 75 percent within about six weeks, she says, and any potential pain can often be effectively alleviated with medication. Throughout the recovery process, the Reno plastic surgeon states that the abdomen may feel a bit tight, and she typically advises patients to remain slightly flexed at the knees and waist in order to minimize any tension on the incision. She also encourages individuals to begin walking around as soon as they feel comfortable enough to do so, as this can help facilitate healing. Heavy lifting (anything over 15 to 20 pounds) and/or strenuous physical activities should be avoided for least six to eight weeks, she says, but normal daily routines – including non-strenuous office jobs – can often be resumed after about one to two weeks. Any potential scarring from tummy tuck surgery generally begins to fade after about two to three months and may take up to two years before reaching its final appearance, notes Dr. McCormack. However, due to its location, she adds that the scar can often be concealed by most articles of clothing, including many underwear and bikini varieties. Ultimately, as previously stated, the tummy tuck recovery process and timeline for recuperation will vary by individual. For the most personalized outline of what to expect after abdominoplasty, Dr. McCormack recommends patients consult with a board certified plastic surgeon who can provide answers based on their unique needs and goals. A graduate of the University of Arizona, College of Medicine, Dr. McCormack completed her training in plastic surgery at the esteemed Stanford University Medical Center. At her practice, she offers an inclusive array of cosmetic procedures for the face, body, and breasts, as well as an expansive range of non-surgical medical spa services. Dr. McCormack is certified by the American Board of Plastic Surgery, and she is a Fellow of the American College of Surgeons. She is available for interview upon request. To learn more, visit plasticsurgeryrenotahoe.com, mommymakeoverreno.com, and plus.google.com/+TiffanyMcCormackMD/about.